While there are many dangers involved in illegal drug use, an often ignored or forgotten one is the danger to your teeth. 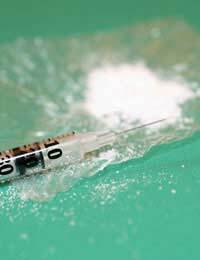 Many illegal drugs can cause damage, either directly or indirectly due to lifestyle habits that tend to go hand-in-hand with the drug use. Whether you're a recreational or regular user of illegal drugs – or perhaps know someone who is – it's important to consider the long-term effects on your teeth. All of these effects have the potential to harm your health as well as impact the aesthetics of your mouth and teeth, possibly influencing future career prospects as well. Cocaine can be disastrous to teeth because the acids in cocaine have an eroding effect on your tooth enamel. They also result in the exposure of teeth to bacteria that can cause decay. Cocaine is sometime rubbed on gums as well and this mixture with saliva is very acidic. Yet another effect of cocaine is that it causes an extremely dry mouth. This dry mouth means there is less saliva to neutralise the mouth and help with bacteria. However, ironically the saliva and cocaine in the mouth wreck havoc as well in terms of the acidic solution that results. Those who smoke crack cocaine run the risk of the effects of smoke on their mouth as well as damage to tooth enamel, gums and even nerves. Those who use the drug known as ecstasy are prone to tooth grinding. Tooth grinding wears down the enamel in much the same way as those who grind their teeth at night. However, one who grinds their teeth at night can usually wear a protective mouth guard to prevent damage to enamel. Those who use ecstasy aren't exactly going to use a mouth guard while awake and high, so there is little to prevent the effects. Other effects of ecstasy use include jaw clenching and a dry mouth. As with cocaine use, a dry mouth reduces saliva and its protective effect in the mouth. Heroin users are notorious for craving sweet, sugary foods. A high consumption of these foods leads to a higher risk of tooth decay. Regular brushing and a good oral hygiene programme plus frequent dental checkups can help. Amphetamines such as methamphetamine or 'crystal meth' can cause significant tooth decay in a relatively brief period of time. In fact, the consequences are so severe in some cases that the term 'meth mouth' was coined. Methamphetamine is very acidic and has a major effect on tooth enamel. On top of that, meth users suffer from jaw clenching, tooth grinding and dry mouth. There are other illegal drugs the can impact your mouth and teeth, so those mentioned above are not an inclusive list. Any kind of illegal drug use has potential to cause harm if it means you don't pay attention to oral hygiene, a healthy diet and general, good dental care. If you are using illegal drugs and have no intention to stop, do try to pay extra attention to your dental hygiene, which can help you prevent the more significant problems later on. Can You Respond to a Dental Emergency?